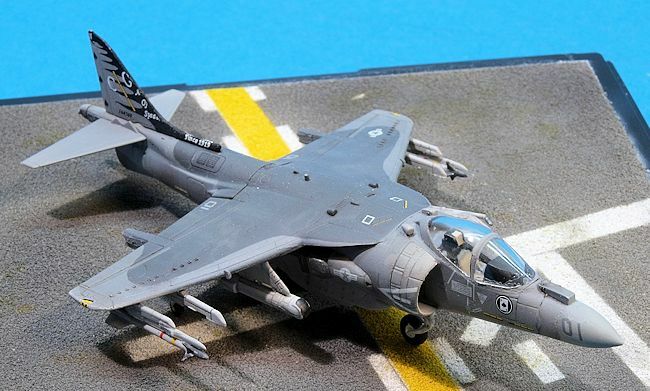 The subject plane is the end of a long development and comprises the current version of the second generation of the originally British Harrier jet. At the time, it is in the active inventories of the USMC and the Spanish and Italian Navies. Its VTOL/STOL capability enables it to operate from smaller carriers and assault ships. A varied and comprehensive weapons load can be carried. The net abounds with info and videos on the plane; moreover, there is a very neat book by Tim McLelland on the Harrier and its development and subtypes. The kit itself is excellent value for money. Its parts are crisply molded, with nice surface details, very good fit, and a full weapons suite. The canopy is well done and clear. The decal options are for one USMC and one Spanish Armada plane. The model is pretty small in this scale, and about 4 inch long. In my perception, it does not need aftermarket items, but something to complement the model in the way of a ladder, tying-down gear and some decent figures would be nice. I still might add something to enhance visual interest, once I get my fingers on it. As it was, the model was built per instructions and straight out of the box. Basic construction was a real weekend job and went hassle-free, with hardly any filler needed. The canopy (which is commendably clear) was attached with white glue and masked using strips of kip #308 tape (like Tamiya´s only cheaper) and Humbrol Maskol. All remaining subassemblies like undercarriage and underwing stores were identified, isolated, cleaned up and pre-painted following the Revell instructions. Revell´s colour scheme as usual refers to their brand of paint, but includes FS numbers, which I found pretty helpful. 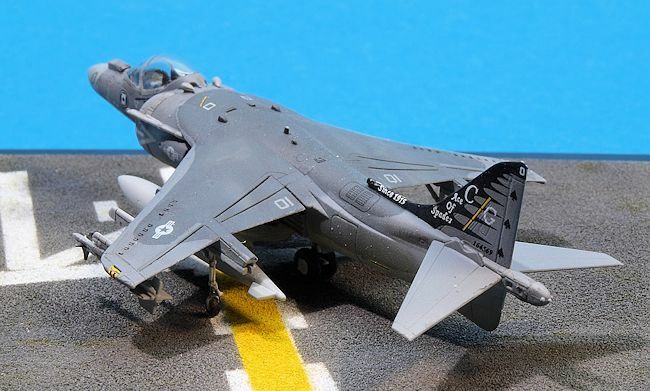 After consulting the online paint reference chart and looking into photos in McLelland´s book, I chose the following three Vallejo ModelAir shades for the paint scheme: Pale Grey Blue, Dark Sea Grey and Dark Blue Grey. How valid that is, I leave to your judgment. After de-greasing with methylated spirits, the model was primed with Vallejo´s PU primer. The various shades were masked with kip tape and sprayed with my new airbrush. Prior to decaling, the model was sprayed with some of my remaining stock of Johnson´s Klear to achieve a reasonably glossy surface. The decals worked mostly fine, save the rather important one for the starboard tailfin, which gave me grief. They do need careful handling. The decals sealed with a flat coat, I did some washing and some general scuffing and weathering, though in a rather subdued way in order not to overdo it. YMMV. I found the very finely done underwing pylons much benefited from the washing. For washing, I use artist´s oils and Humbrol thinners. Moreover, some pastel chalks were used. Now the remaining subassemblies were attached to the model, the wheels needing some careful sanding so all of them touched ground. With a model as small as this, the undercarriage is inherently iffy, but it was manageable. 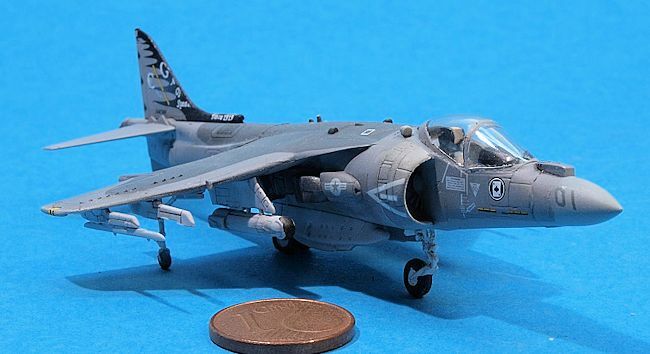 After a final flat coat to blend things in , the canopy masks were removed and the model declared done. For improved display and storage, I bought a small Trumpeter display box. Its display space was masked around the edges, and sprayed with gloss clear from a rattle can. Onto the fresh and sticky paint fine sand was applied and the whole thing let cure. That gave the coarse texture I wanted, simulating the anti-skid coating on flight decks. Loosely based on current US assault ship markings, I applied various lines in white and masked them. Now yellow was sprayed and masked, and finally various shades of grey and brown. The masks removed, some oil staining was applied to grunge up the surface a bit, and finally the model glued to the base with flat-curing PVA glue. 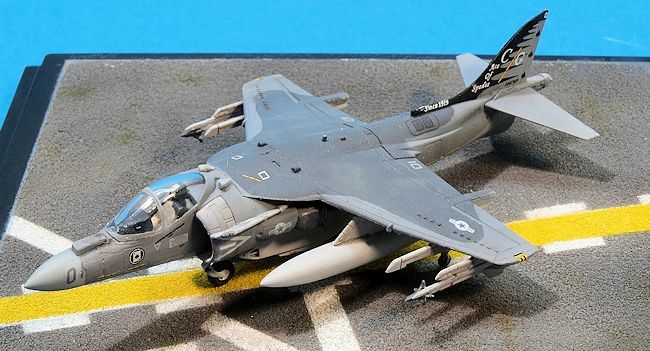 All in all this is an excellent kit that offers tremendous value for money (you see them for as cheap as 4 € here), fits well, is really buildable and results in a very nice-looking model.